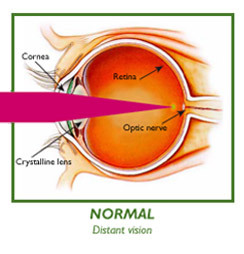 Symptom: near vision and distance vision are blurred. It occurs after a certain age. Cause: it is caused by a shorter-than-normal eyeball or a too “flat” cornea. So, rays of light are focused behind the retina. 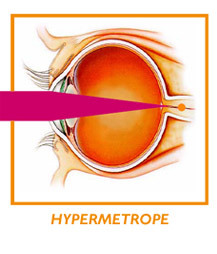 Treatment: hyperopia is corrected by wearing converging glasses or contact glasses. 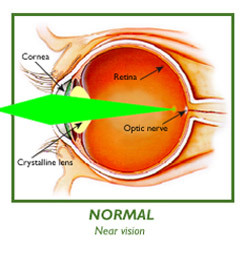 The same optical effect is obtained by bulging out the central cornea with laser.